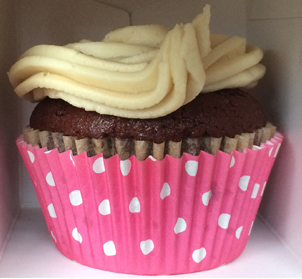 12 Vanilla Bean Cupcakes with Strawberry Frosting – The Pink Bakery, Inc.
Our vanilla bean cupcakes are made with organic Vanilla beans that have a sweet perfumed aroma leaving a smooth taste in your mouth. 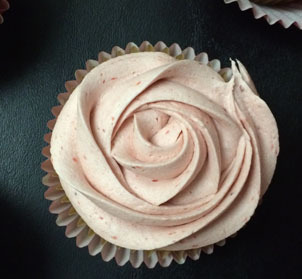 We top our cupcakes with our creamy strawberry infused frosting. It is light and fluffy and full of organic strawberries. Ingredients: Lots of Love, Organic Fair Trade Vegan Cane Sugar, Organic Vegan Powdered Sugar (tapioca starch), Organic Sorghum Flour, Organic Arrowroot Flour, Water, Non-GMO Light Olive Oil, Organic Cocoa Butter, Organic Strawberries, Organic Amber Maple Syrup, Non-GMO Sunflower Lecithin (solvent free), Organic Vanilla Beans, Non-GMO Apple Cider Vinegar, Non-GMO Xanthan Gum (xanthomonas campestris – Non-GMO European Maize derivative), Non-GMO Baking Powder (potato starch) and Non-GMO Baking Soda. 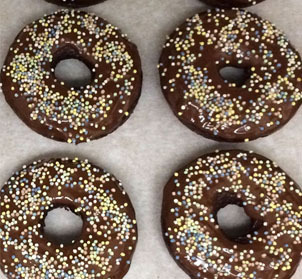 The Pink Bakery, Inc. is TN’s 1st Big 8 Allergen Free Bakery. 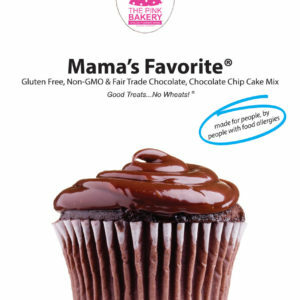 We make desserts and mixes for people with food allergies to the Big 8 foods. We use only organic, Non-GMO, gluten free, Fair Trade and responsibly sourced ingredients. The desserts and mixes are naturally vegan. Made in a state inspected dedicated kitchen so there is no worry of cross contamination. Website made with love by The Pink Bakery, Inc.